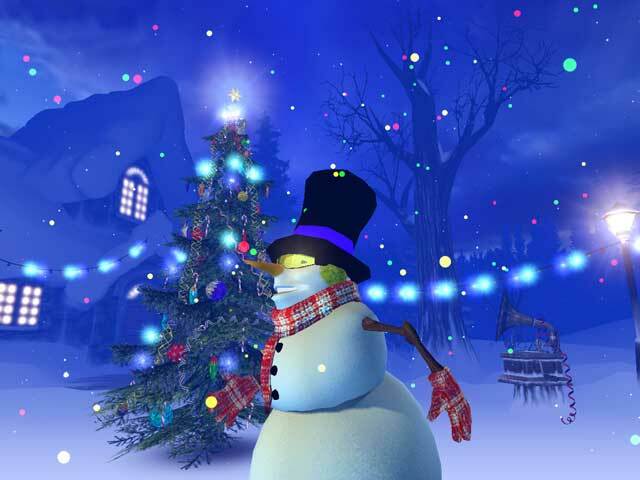 3d, screensaver, holiday, fantasy, christmas tree, snowman, presents The season of greetings comes early this year with Christmas 3D Screensaver! Do you like Christmas? Too bad it comes only once a year. Hey, if you really, really like Christmas - why not have it every day? Christmas 3D Screensaver brings the warm feelings of joy right to your computer desktop. Share these feelings with your family, friends and coworkers. Unfortunately, a lot of folks can't afford to have a dressed Christmas tree every year for one reason or another. But our PC desktop Christmas tree never ages! In some parts of the world it never snows. It's not a problem with Christmas 3D Screensaver; the right kind of weather - frosty, with a lot of snow - is guaranteed. See, how simple it is - no need to pick a Christmas tree, no time spent dressing it, no worries about what kind of weather it's going to be - one download and Christmas comes to you. Are you expecting a "traditional" Christmas screensaver? Then you are up for a big surprise. How about a dancing snowman that experiments with fireworks, dresses up Christmas tree, turns the lights on and off and plays different vinyl records? Who said Christmas can't be a bit crazy? The screensaver features great sound effects and spectacular 3D graphics. Most importantly, this 3D Christmas screensaver is a cool way to cheer yourself and your friends up during the long, dull workdays filled with worries and concerns. Christmas 3D Screensaver is a creation of 3PlaneSoft (www.3planesoft.com) - a well-known developer of artistic 3D screensavers, like Ancient Castle 3D Screensaver, Nautilus 3D Screensaver, Fantasy Moon 3D Screensaver and many others. EarthView is a dynamic desktop wallpaper and screen saver, which displays beautiful views of the earth with daylight and night shadows. It produces high quality images for every screen resolution - even beyond 1600x1200! InfoClock Screensaver is not only usual clock screensaver. It is screensaver which shows the full information about time and date. Stylish analog clock are periodically supplemented with digital clock and a monthly calendar. WireWorld 3D Screensaver - Look into a hunk of electric wires. Attention! All the wires under high voltage!! !